I love to read, and I hope that at least one of the books I shared has intrigued you enough to read it too. If so, please let me know! Here’s my annual wrap-up of the best books I’ve read this year (though not necessarily published this year) – with a special thanks to the Hawaii Public Libraries! Make friends with books and have a Happy New Year! The year isn’t over yet, but 2012 has been filled with helpful people, some of whom we meet only once, and may not even know their names; and fun, exciting events sponsored by businesses who are dedicated to being good neighbors. We remember to thank our family and friends, but I’d like to take a moment to thank some of the people and businesses that have touched our lives. Mahalo to our neighborhood parks at Koko Head and Kamilo Iki for their free after-school classes. My 6-year old son has played basketball, table tennis, and games; and learned to draw and paint with friendly teachers. Mahalo to our neighborhood libraries in Hawaii Kai, Aina Haina, and Kaimuki for storytimes, puzzletimes, and special events. Mahalo to Hawaii Kai Youth Baseball and the volunteer coaches, Chelsea and Justin, and the parent supporters on my son’s baseball team this summer. I really appreciate their time and patience! Mahalo to the concerned man who made sure that I was okay and the thoughtful woman who bought me a Sprite to make sure that I was hydrated when I had a dizzy spell at a Home Depot Kids Workshop in July. I felt cared for. Mahalo to Barnes and Noble for their weekly storytimes and special events; and for the free cupcake on my son’s birthday. Mahalo to The Home Depot and Lowe’s for their free monthly kids workshops, teaching them about careful building and giving them a sense of accomplishment (my son’s favorite projects have been a “savings shed” and a race car). Mahalo to the Honolulu Museum of Art and Bank of Hawaii for their free Family Sundays (the haunted house in October was so much fun!). Mahalo to the Lego Store for their monthly mini-build Lego events (my son built an owl and a black cat). Mahalo to Iolani Palace for their Royal Easter Egg Hunt and Ward Centers for the Easter Bunny Treat Trail. Mahalo to Hawaii Kai Town Center for their Halloween Spooktacular and Holiday Tree Lighting Ceremony; Koko Marina Center for their Halloween Trick-or-Treat, Keiki Kalikimaka Parade, and Christmas Carnival; and Salt Lake Shopping Center for their Fun-in-the-Sun Mele Kalikimaka. Mahalo to 7-Eleven, which gave away free slurpees on July 11. Mahalo to Arby’s, which gave away free curly fries on Tax Day in April. Mahalo to Burger King, which gave away free onion rings to celebrate the Super Bowl in February. Mahalo to Cinnabon, which tried to make Tax Day a little sweeter with two free Bites in April. Mahalo to IHOP, which gave away free pancakes on National Pancake Day in March. Mahalo to Panda Express, which gave away free firecracker chicken in honor of the Chinese New Year in January; and free peppercorn shrimp in February. Mahalo to Yogurtland, which gave away free yogurt on National Frozen Yogurt Day in February. What are you thankful for? Who will you thank today? I believe in preschool. I attended two years of preschool myself. My parents tell me that I didn’t like it – the teachers were too strict. My son also attended two years of preschool, and he enjoyed it enormously – he was ready for a little independence and we were ready to let him spread his wings. These ads really made me think about the value of preschool. Did preschool really give me an advantage in school? If I hadn’t sent my son to preschool, would he really have been behind the other students, never quite able to catch up? According to BeMyVoiceHawaii.org, young children are ready for early learning – 85% of human brain development occurs before age five. And in Hawaii, every $1 spent on quality early education services means a $4.20 return on investment in reduced spending on social welfare programs. It’s tempting to think that preschool is a “silver bullet” that can solve Hawaii’s problems with education and poverty. I’m sure that legislators will debate whether the Department of Education can provide high-quality, meaningful preschool, and whether we can afford to offer preschool to all Hawaii children. But there is a more fundamental question: is preschool crucial for a child to do well in school? 2. “Children are not ready for sustained learning programs until ages eight to ten” (page xvi). Younger children may not be developmentally ready for structured learning – their brains may not be developed enough for reasoning, their eyes may not see well enough to read close text, and their ears may not readily distinguish and remember sounds. 3. Early separation from parents is the principle source of anxiety and behavioral problems; and that early schooling can lead to an unhappy school experience and lower achievement. Where do you stand on the issue of preschool? Can Hawaii provide preschool effectively and can taxpayers afford it? How important is preschool for our children’s future? Hawaii might be the happiest state in America. Hawaii residents have the highest well-being in the nation, according to the 2011 Gallup-Healthways Well-Being Index. Hawaii residents also reported the lowest level of mental distress, according to a 2009 “American Journal of Preventative Medicine” study. What makes us so happy that we live in Hawaii? More than any other factor, including income, education level, and religion, the place where you live determines your level of happiness, claims researcher Dan Buettner in his book, “Thrive: Finding Happiness the Blue Zones Way” (2010). The National Geographic Society sent Buettner around the globe to some of the world’s happiest places, based on people who declare that they are happy – and expect to be even happier in the future. * Find security. Live in a secure city, with strict criminal laws and restrictions. * Build trust. Live in trustworthy places, surround yourself with trustworthy friends, and be trustworthy yourself. * Be tolerant. Accept other cultures religions, and lifestyles. * Forget status. Live modestly. Build friendships with those who accept you and don’t make you feel inferior. * Socialize more. Interact with others by joining associations and volunteering in your community. * Commit to a high standard of government. Government must have fair legal institutions, a lack of corruption, trustworthy legal systems, and a strong democratic process. * Promote economic freedom. People should have the freedom to start and run a business, free of excessive regulation. Government should not favor one business or industry over another. * Keep people employed. Having a job gives people a sense of purpose, confidence, and self-worth. Government can help with programs that give people meaningful jobs. * Support art and community spaces. People are generally happier the more they socialize. Communities can develop parks, art gardens, vibrant city centers, outdoor restaurants, public gardens, theatres, museums, and pedestrian malls to promote social interaction and well-being. * Encourage walkability. Encourage people to live closer to their workplaces by building wider sidewalks, more bike lanes, and adding pedestrian walkways. Does living in Hawaii help you be happy? Does Hawaii help you thrive? Take the True Happiness Test at http://apps.bluezones.com/happiness/ and let us know whether you agree with your happiness score. According to Hawaiian tradition, Mokili‘i (Chinaman’s Hat) was created by the goddess Hi‘iaka, Pele’s sister, after a mythic struggle with a gigantic mo‘o (dragon). Hi‘iaka slayed the mo‘o, Mokoli‘i, set its huge flukes in the water as a landmark, and spread its enormous lizard-like body to form the lowlands below the Ko‘olau Mountain Range at Kualoa to provide travelers with a broad, flat pathway. Ka‘ena, a cape of land at the western-most point of Oah‘u, is said to have been created by the demigod Māui when he attempted to fish Kaua‘i closer to O‘ahu. Using his magic fishhook Manaiakalani, Māui snagged the base of Kaua‘i and pulled with all his might. But his followers broke the spell and the hook released itself from Kaua‘i, bringing with it a small piece of the island that dropped into the waters off Ka‘ena Point that is known as Pōhaku o Kaua‘i. These glimpses into Hawaiian myth and more are revealed in “Ancient Sites of O‘ahu: A Guide to Hawaiian Archeological Places of Interest” (2010) by Van James. 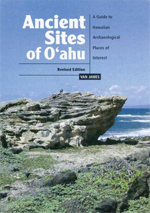 The book begins with a brief background on Hawaiian culture and a summary of the five major types of sites found on O’ahu: heiau (temples) and shrines, pōhaku (stones), petroglyphs (engravings in rock), caves and rock shelters, and loko (fishponds). The 50 ancient sites are grouped into five general regions of O‘ahu, and presented with site descriptions, location maps, and site photos. There is even a helpful appendix with a pronunciation guide and glossary. #8 Nu‘uanu Petroglyphs (Nu‘uanu): Numerous carved animal and human figures can be found at three separate sites near Alapena Pool below Kapena Falls. The dog depicted in stone carvings is believed to be a guardian spirit of Kapena Falls. Located behind Nu‘uanu Memorial Park Cemetary, along the trail west of Nu‘uanu Stream. #22 Pahukini Heiau (Kailua): A rectangular enclosure of stacked rock walls, once standing 6′ high and measuring about 120′ by 180′, this heiau was believed to be built by Chief ‘Olopana about AD 1100. Located inside the Kapa‘a City Landfill, off Quarry Road, above Kawai Nui Swamp Regional Park. #26 He‘eia Fishpond (Kaneohe): An 88-acre brackish-water pond with walls made of lava and coral fill, and a 5,000 foot long enclosing seawall. There were originally four watchtowers and six sluice gates. According to legend, it was protected by a mo‘o named Meheanu. Located adjacent to He‘eia State Park and Ke‘alohi Point, and best seen from He‘eia State Park. #35 Pu’u o Mahuka Heiau (Waimea): The largest heiau on O‘ahu, it measures 575′ by 170′, with three adjoining enclosures and a low surrounding wall, paved with waterworn pebbles from Waimea Stream. Believed to be built by Menehune, the great kahuna communed with the akua (god) Mahuka. Signal fires were used to communicate between the heiau and the sacred complex at Wailua on Kaua‘i. Located east of Waimea Bay off Pūpukea Road. #41 Kūkaniloko (Wahiawā): Once the birthplace of high-ranking kapu ali‘i, the Kūkaniloko pōhaku (stones) were once arranged in two rows of 18 lava rocks facing north and flanking a central birthing stone. According to Hawaiian tradition, ‘aumākua inhabited the stones and could relieve labor pains and ease the birthing process. The site is believed to be aligned with important places on O‘ahu, may have astronomical significance, and is often referred to as the piko (navel) of the island. Today, the stones lie haphazardly in a small grove of coconut and eucalyptus trees. Located between Wahiawā and Hale‘iwa, off Kamehameha Highway, opposite the road to Whitmore Village. #48 Kāne‘’ākī Heiau (Mākaha): Once an agricultural heiau dedicated to the god Lono and later a luakini heiau (human sacrifice temple), it was constructed as early as AD 1545 with a two-terrace structure. Today you can see an upper stone platform with restored thatched hale (houses), a wooden lele (offering stand), ‘anu‘u (oracle towers), and a small carved image of the god Kū. Located off Mākaha Valley Road, past the golf course, on Ala Holo Loop in Upper Mākaha Valley. Call Mauna‘olu Estates at 695-8174 for visiting hours; check in at the guard station. #49 Mauna Lahilahi (Mākaha): Once sacred to the god Kāne and marked as a prime fishing spot by the fish god Ai‘ai, it is a high rock with a 230′ summit projecting from a sandy beach. There are numerous ancient rockwall enclosures, small stone platforms, several shrines, a possible heiau site, burial sites, and more than two dozen dog and human petroglyph figures abraded into the coastal rock cliff. Located adjacent to Mauna Lahilahi Beach Park and approached from Lahilahi Place off Farrington Highway. How important is it to you to preserve historical sites? Do you feel a spiritual connection to places in Hawai‘i or your community? You are currently browsing the Better Hawaii weblog archives for December 2012. Better Hawaii syndicates its weblog posts and Comments using a technology called RSS (Real Simple Syndication). You can use a service like Bloglines to get notified when there are new posts to this weblog.